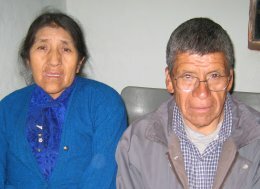 Severino has been committed to taking the Gospel to the villages of the Cajamarca province since 1983. God has used him to plant many churches. Severino also visits and encourages established churches throughout the Cajamarca countryside. He is committed to training, teaching and evangelising. Severino sells Christian literature on his journeys to help supplement his income. Bright Hope World has partnered with Godofredo Rubio (PER01) as he seeks to evangelise in the Cajamarca region of Peru since 2001. In mid 2008 he approached us regarding the possibility of financially supporting Severino as he seeks not only to plant churches but also encourage and strengthen the existing churches. Directly this project supports Severino and his immediate family. However the wider church and local communities also benefit as he has more time available for evangelism, training and teaching. Severino is a Godly man with a real heart for people and a desire to see God's kingdom grow in Peru. He has been committed to this work since 1983 and we are glad to be able to support him in this way, enabling him to spend more time in this ministry without the concerns of having to financially provide for his family. Severino was born in 1947 and is married to Maria Tafus Toledo. They have one adult child, Juana, who lives with them. They also have a grandson, Juan Carlos, who they have adopted as their own son and who lives with them. Severino has a vision to plant new churches within Peru, to disciple believers and to train and build up the church.